Erin Cortus, a South Dakota State University ag engineer, shares the care, science and technology of raising pigs. Animal care, environmental sustainability and responsible antibiotic use are all questions consumers have about today’s pork production. To help answer these questions, the Pork Checkoff has been inviting influencers onto farms across the country. “During the past few years, we have taken the critical step of building consumer trust by offering farm tours to reach influencers,” said Steve Rommereim, vice president of the National Pork Board and a pork producer from Alcester, South Dakota. 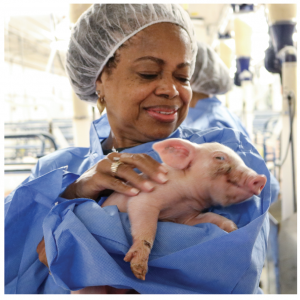 This year, five farms and the Checkoff offered a glimpse of life on a pig farm to more than 60 key influencers, including national journalists, registered dietitians and food bloggers. In addition to the Checkoff, hosts were Smithfield Hog Production, Missouri; Iowa Select Farms; Rommereim Farms, South Dakota; South Dakota State University; Wakefield Pork, Minnesota; and Pipestone Veterinary Services, Minnesota. participated in a farm tour in Missouri where they learned about environmental sustainability. 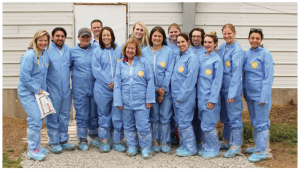 Nearly 30 influential registered dietitians participated in three of the farm tours this year, including one held with Midwest Dairy in Minnesota during September. “The science of raising pigs helps us connect with this audience,” said Adria Huseth, who is a registered dietitian and manager of nutrition communications and research for the Checkoff. 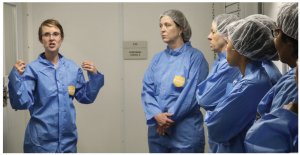 Lincoln Langhorst, owner of Wakefield Pork which hosted the registered dietitian tour in September, says that opening up farms to dietitians is a win-win. “Targeting registered dietitians is important because their clients are asking them questions about how food is raised,” Langhorst said. Registered dietitians play a key role in telling consumers what happens on pig farms. According to Huseth, a survey is sent to each registered dietitian before and after a farm tour. Results of one are shown on page 26. “We’ve seen an increase in how confident these influencers are in talking about pork production with their consumers,” said Huseth. For the third year, the Pass The Pork Tour showed food bloggers what it takes to raise pigs today, from insemination on a sow farm to learning about pigs rations made at an on-farm feed mill. The bloggers on this year’s tour reached nearly 14 million people with their online followers. The bloggers also participated in a pork fabrication demonstration and a cooking experience that showcased the versatility of pork across the menu.